Gary France is a native of Syracuse, New York, USA. Mr France, now living in Australia, performs in a wide range of musical genres. He received his Bachelor of Music degree, Music Education, in 1979, from the Crane School of Music, SUNY Potsdam, and his Master of Music degree, Orchestral Performance / Jazz, in 1988 at the University of North Texas. While at UNT Gary became the first drummer/percussionist, in the fifty-year history of the program, to direct one of the prestigious Jazz Lab Bands. Since settling in Australian in 1987, as the inaugural lecturer in Percussion at the W.A. 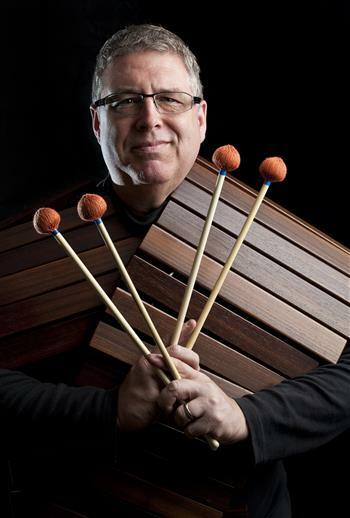 Conservatorium of Music, Gary France has done much, through his dedicated teaching and performing on a wide range of percussion instruments, to significantly raise the profile of percussion playing in Australia. He is regularly employed by peak music bodies such as the Australian Youth Orchestra and the Australian National Academy of Music to tutor developing percussionists. His former students now hold prominent positions as performers, educators and executives in the music industry both here in Australia and abroad. Since 1997 Mr France has coordinated and nurtured the Percussion program at the Australian National University. Mr France has performed with the West Australian Symphony Orchestra, the Nova Ensemble, the West Australian Opera and Ballet Orchestras, the Dallas Brass, the Doddworth Saxhorn Ensemble, the Australian Chamber Orchestra and the Canberra Symphony with whom he performed William Kraft's "Concerto for Timpani and Orchestra" in 2001. Gary's list of recent world premiers include works by Larry Sitsky, Sir Michael Tippet, Roger Smalley, Ross Edwards, Peter Sculthorpe, Robert Cucinotta, Edward Applebaum and Robert Casteels. As a jazz drummer Gary's list of other musical credits include: James Morrison, Richie Cole, Nat Adderley, Dale Barlow, Jim McNeeley, Urbie Green, John Clayton, Emily Remler, Peter Leutch, Phil Wilson, Clifford Jordan and numerous others. Gary is also well known as the founder and artistic director of the 18 piece Perth Jazz Orchestra as well as drummer with the nationally acclaimed western swing group Dude Ranch featuring Lucky Oceans. As a clinician for Yamaha Musical Products, the Sabian Cymbal Company and Innovative Percussion Products he has toured internationally presenting master classes, concerts and workshops throughout the U.S., China, Australia and New Zealand. His own personal research in world music's has led him to India, Africa and South East Asia. These direct field studies support Gary in his role as director of the ANU "DRUMatiX" Percussion Group. Gary France has extensive leadership experience: A former head of the West Australian Conservatorium of Music and the ANU School of Music as well as Convener/Artistic Director of numerous major events such as Heartbeat multi-cultural Music Festival (1995), the Australian National Marimba Festival (2001) the Rhythms of Life Percussion Festival (2002) the Australian National Percussion Symposium (2003) and the Australian Music Educators National Conference (2005). Mr. France is currently the Lead Principal Investigator in the ANU New Media Laboratory (NML), a research team that explores the multifaceted relationships between digital technology and acoustic instruments. His most recent projects have included composing the sound design and music for the Australian premiere production of QED by Peter Parnell (West Wing), Video Phase by Steve Reich with performances at the Taiwan- Australia New Media Art Symposium (AUS 2006) and KOSA International Percussion Festival (USA 2006), collaborative composition and performance for the Southeast Asian segment of the Opening Ceremonies (15th Asian Games DOHA 2006), and the New Directions Music Festival (Singapore 2005). Gary France was honoured to receive nominations to the Board of Directors of the Percussive Arts Society International in both 2005 and 2006, receiving an appointment in 2007.